The girls' softball game scheduled for today against El Dorado has been canceled. Softball Game Rescheduled: The softball game against Junction City which was scheduled for Thursday will be played Wednesday at 4:30 pm. Smackover Elementary School spring pictures will be taken Thursday, March 7, 2019. All students will take pictures. Proofs and prices will be sent home at a later date. Reminder - The SNSD will be CLOSED on Monday, January 21st in observance of the MLK Holiday! Again..... NO school on Monday! Classes will resume on Tuesday, January 22nd. Report Cards for Smackover-Norphlet Students go out today, Tuesday, January 8th! Report Cards for Smackover-Norphlet Students go out tomorrow, Tuesday, January 8th! The SNSD will dismiss early tomorrow, Friday, November 16th, at 1 PM. There will be NO school the week of November 19-23, 2018, for Thanksgiving Break. School will resume on Monday, November 26, 2018. Progress Reports for Smackover-Norphlet Students go out tomorrow, Friday, November 16th! The Smackover Buckaroos will play Danville in the second round of the high school football playoffs on Fri., Nov. 16, at 7 pm. Due to the condition of the field from rain this past week, the game will be played at the El Dorado Stadium. Tickets for the game will be $6. SHS Seniors: Ad Reservations and Money for Ads are due this WEDNESDAY to Mrs. Tonya Corley! Reminder: SHS Senior ads for the yearbook are due by October 31st to Mrs. Tonya Corley. SHS and SES Picture Retake Day will be on Thursday, October 18th. Senior Make-Up Pictures will also be taken on this day. Smackover-Norphlet Parents -- Our Norphlet Campus received a threatening call at our Middle School this morning. Police were notified and are investigating. A police presence will remain on both Norphlet campuses for the remainder of the day to ensure the safety of all students and staff. Parent Teacher Conferences will be held tomorrow Thursday, Sept. 27th for NES and NMS. School will dismiss at 12:30 PM for K-12. Conferences will be held from 1:30 PM to 7 PM. Smackover Preschool will be open regular hours on this day. LATEST CORRECTION: Parent Teacher Conferences will be held next week: Tues. (Sept. 25) - SES and SHS. ; Thurs. (Sept. 27) - NES and NMS School will dismiss at 12:30 both days for K-12. Smackover Preschool will be open regular hours both days. Conferences will be held from 1 pm to 7 pm. There will be a Smackover High School Booster Club meeting on Monday, September 10, at 6 pm. The meeting will be held in the indoor practice facility. All parents of all sports are encouraged to attend. SHS Students............Don't forget......... School and Activity Pictures are on Monday, September 10th! The Smackover-Norphlet 7th Grade and Junior High Football game in Hampton has been canceled tonight due to inclement weather. Again.....no football game tonight. The 2017-2018 Smackover High School yearbooks have arrived! Last year's seniors can pick up their yearbook at the SHS office. Extra yearbooks are available for sale in the SHS office for $50 on a first come, first serve basis. Smackover High School band, golf, and tennis pictures will be taken Monday, September 10th, beginning at 7:50 a.m. The game between Smackover and Hampton scheduled for Friday night, September 7th, has been canceled. Football Schedule Update: Tonight's SHS football benefit game with Magnet Cove has been moved to Glen Rose. The game will be played at 7 pm. Winning Streak Photography will be taking Senior Yearbook Pictures on Thursday, August 9th, from 9 am - 3 pm in the Smackover High School library. See our website's News Section for more information. Smackover High School registration for seniors will be Wednesday, August 8, from 12 - 1:30 pm. Senior pictures will be taken Thursday, August 9, from 9 am to 3 pm. Graduation pictures from May, 2018 are now available. Pictures may be picked up at the SHS office Monday through Thursday between the hours of 7 a.m. and 5 p.m. Reminder: the SNSD will dismiss at 12:30 PM on Mon, May 14, for NES, NMS, SES, and SHS (NOT SPS). We will also dismiss at 12:30 PM on Tues, May 15 for NES, NMS, SES, SHS, and SPS on this day. SHS Seniors AR deadline is Tuesday, May 1st. AR deadline for SHS 9th - 11th grades is Wednesday, May 16th! SHS Juniors or Seniors interested in the UAMS Pharmacy Camp this summer, please see Mrs. Rainwater for an application. Completed applications are due to Mrs. Rainwater no later than May 1st. SHS Tennis Sign-Up Sheets are available in the SHS Office. Try-outs are June 2, 2018. NES and SHS Parents: You are invited to take a School Safety Survey today through Friday. You can find the link to these surveys on our Central Office and NES/SHS pages, under the News section. SHS Seniors Reminder: All Senior Ad money and photos are due to Mrs. Tonya Corley by tomorrow, Friday, March 30th. SHS Seniors: All Senior Ad money and photos are due to Mrs. Tonya Corley by March 31st. SHS Students and Parents: Don't forget to purchase your 2018 yearbook at Jostens.com OR the SHS office for $45. SHS Seniors: Senior ad photos and payments are due by March 31st. SHS Seniors: American Legion and El Dorado Service League Scholarship Applications are due to Mrs. Corley by Friday, March 2, 2018. SHS Seniors planning to attend SouthARK after graduation -- March 1st is the Priority Scholarship Deadline! The Smackover-Norphlet School Board will hold its regular Board Meeting Monday, February 26, 2018, at 5:30 P.M. in the Boardroom of the Central Office. See our News section for a copy of the Agenda. Alumni Game Postponed again...Due to weather and field conditions, the Alumni Games scheduled for this weekend will be postponed again. The new date will be Saturday, March 3rd. SHS Basketball Senior Night: Senior night for basketball will be Friday night, February 9, as the Buckaroos play Fordyce. The senior ceremony will be after the first game played (Junior Girls). SHS Shooting Sports Club will be starting practice Saturday, February 10th, at 9 AM at the Camden Trap Club. The next SHS Blood Drive is Monday, February 12th. Student's Sign-Up with Mrs. Richardson. Students MUST be AT LEAST 16, but all 16 year olds MUST get a Permission Slip signed. SHS Students interested in trying out for Senior High Cheer MUST have a current (within the last 12 months) physical. FFA Chapter Meeting tonight, February 5, 2018, at 6 PM, at SHS in the Hobgood Auditorium. There will be pizza and "Minute to Win It" Games and Prizes! SES will be having a "Be an Olympian, Go for the Gold, READ!!!" Book Fair from February 2 - 9, 2018. See our News section for more information. SHS Beta Club Induction will be held on Thursday, February 1st. Registration is now underway for the spring Youth Softball Season. See The Buckaroo Blog for a Registration Form. deadline to submit registration forms is February 9, 2018. Mark your calendars Juniors and Seniors: SHS Prom has been scheduled for Saturday, April 7, 2018, at Riverwoods in Camden. Students participating in senior band All-Region tryouts need to be at the band hall Saturday morning, January 13, at 9:15 am. The bus will leave at 9:45 sharp! The Norphlet Elementary School Awards Assembly has been rescheduled for Tuesday, January 16th. Kindergarten-2nd Grade will be at 9 AM and 3rd-5th Grade will be at 10:30 AM. The SNSD will dismiss school at 2 PM this Mon. -Wed., Dec. 18th - 20th. Our Christmas/New Year's Holiday Break is from Dec. 21st - Jan. 3rd, 2018, with classes resuming on Thurs., Jan. 4th, 2018. SES' Family Christmas Night tonight! Activities: escape rooms, Santa pictures, photo booth, Christmas stories, and more! Hamburger supper: 5 pm. (Must have pre-purchased Tickets). Christmas activities: 5:30 pm. SES will have a Christmas Family Night tomorrow, Tues., Dec. 12, from 5:30-7:00 PM. If you purchased a Hamburger Dinner Plate, these will be served in the Smackover Cafeteria from 5-6 PM. Shooting Sports Registration: Students who are interested in participating in Shooting Sports must submit all paperwork to Mr. Edney at SHS prior to Christmas break. Senior Boys, Senior Girls, and 9th Grade Boys and Girls Basketball Pictures will be made Friday, December 15th, at 10:30 AM. The last day of classes for this semester for SHS Students who attend classes at the Secondary Tech Center is this Friday, December 8th. Classes will resume on January 10th. SES Parents, Don't forget....If you plan on Purchasing a Hamburger Dinner Plate for tomorrow's Christmas Family Night, orders must be turned in by 3 PM today. SES will have a Christmas Family Night on Tues., Dec. 12, from 5:30-7:00 PM. If you plan on Purchasing a Hamburger Dinner Plate for the evening, orders must be turned in by Mon., Dec. 4 by 3 PM. Saturday's basketball game will be played in Norphlet. Games will be starting at 9:00 am with 7th grade girls followed by the 7th grade boys, Jr girls and Jr boys. SES will be having a Christmas Family Night on Tues., Dec. 12, from 5:30-7 pm. Hamburger dinner plates will be served in the cafeteria for $5 each. If you plan on purchasing a Hamburger dinner plate that evening, all orders must be turned in by Mon., Dec. 4, by 3 pm. Basketball Update: The SHS Varsity Boys Basketball Team will be playing tonight, December 1st, at 5:15 pm at Drew Central High School in Monticello against Valley Springs. Smackover Elementary will be having a Christmas Family Night on Tuesday, December 12, from 5:30-7:00 PM. Parents, if you plan on Purchasing a Hamburger Dinner Plate for the evening, all orders must be turned in by Monday, December 4 by 3:00 PM. A Message from SouthArk: The last day of classes this semester for secondary students attending classes at the Secondary Tech Center is Friday, December 8th. Classes at the Secondary Tech Center will resume on January 10th. SHS Seniors and Parents - Don't Forget our Financial Aid Night tonight, Thursday, November 30th, from 6 to 8 PM in the SHS Library. Bring your 2016 taxes and complete your 2018-2019 FAFSA! The SNSD will hold a School Board Meeting tonight at 6:30 PM in the Central Office Conference Room. For a copy of Meeting Agendas and Minutes, go to the CO page, click on State Required Information link, and scroll down to the School Board Agendas and Meeting Minutes section. SHS Students, show your Buckaroo Pride this Friday as the Bucks take on the Mayflower Eagles! Wear your Black/White and/or Buckaroo Shirts! GO BUCKS! Get Your BLUE on! SHS will celebrate National Diabetic Day on Tues., Nov. 14, by wearing blue bracelets to increase an awareness of the effects of diabetes and complications caused by the disease. Seniors: The deadline for senior pages in the yearbook has been extended to Fri., Nov. 17th! Please see Mrs. Tonya Corley for more information. SES has a Veteran's Day Assembly tomorrow at 9 AM in the Hobgood Auditorium. The assembly is sponsored by the SES Student Council. Reception to follow the assembly. Join us as we honor our Veterans! PLAYOFF FEVER!!! Round 1 of the State Playoffs here at Buckaroo Stadium Friday night! Friday's theme is AMERICA Day! Show your Buckaroo AND American Pride - Wear Red, White, and Blue. The NES Fundraiser pick up is Wednesday, November 1st, from 1:30- 3:30 pm. Parents who have children that sold items will need to make arrangements to pick up the fundraising items during this time. SHS Seniors -- Reservations for your yearbook senior ads are due TODAY!!! Half the price for the page is due at this time and is NOT refundable. See Mrs. Tonya Corley! SHS Pep Rally Spirit Day is Thursday! It is Beat Genoa Central Day -- SHS, Wear Your Favorite College Team T-Shirts! Our November Breakfast and Lunch Menus are now available! Check out the GREAT meals we have planned under each Campus Dining Sections OR under our Documents sections in the Dining/Cafeteria folders. Don't Forget...SES and SHS will have a FLU Clinic tomorrow, Thursday, October 19, 2017. Students, please make sure your Flu Shot Forms have been turned in to the school. SHS Students: This Friday's Spirit Day theme is White Out the Dragons. Please wear white on Friday! Remember students who participate qualify for a raffle drawing at the pep rally. SES and SHS will have a FLU Clinic this Thursday, October 19, 2017. Students, please make sure your Flu Shot Forms have been turned in to the school. Seniors don't forget: The Union County College Night is tonight (Oct. 17, 2017) from 6-8 PM, at the El Dorado Conference Center. Be sure to take your barcode page with you! A Union County College Night will be held Tues., Oct. 17th, 2017, from 6-8 PM, at the El Dorado Conference Center. Over 25 colleges and universities from around the state and region will be there! Notice to concurrent College Algebra Students going to SouthArk: SHS has been notified that you will go next Tues. and Wed. instead of Mon. and Wed. since we are out of school on Mon., Oct. 16th. SHS Students - Tomorrow (Thursday, Oct. 12th) is the last day to take AR tests in the SHS library. Seniors - Reservations for your Senior yearbook ads are due by Oct. 31st. Half the price for the page is due then and is not refundable. Please turn in Contract Letters to Mrs. Tonya Corley. Picture Retakes for SES and SHS (Grades 9-11) tomorrow! $5 charge for those wanting retakes. No charge for those who missed their pictures the first time. Reminder - Parent meeting tomorrow, Oct. 10th, for 6th through 12th grade students who are interested in participating in shooting sports this year. The meeting is at 6:30 pm in the SHS cafeteria. SHS Seniors and Parents, Don't forget our Financial Aid Night tomorrow, Oct. 10th, from 6 to 8 PM in the SHS Library. Bring your 2016 Taxes and complete a 2017-2018 FAFSA! Clarification Statement: Friday night's SHS Football game will be played AT Drew Central. Congratulations to our Girls' Golf Team who are 3A State Runners-Up! On December 16, 2017, the Smackover choir will perform with the South Arkansas Symphony Orchestra and local school choirs at the Municipal Auditorium in El Dorado at 7:30 pm. Smackover High School Homecoming Campus Tours will be given by the Student Council on Homecoming Day, September 22, between 10 am and 12 pm. The Smackover High School Homecoming Bonfire will be Tuesday, September 19, at 7:00 pm, with the snake dance and pep rally. Game Time Change: The football game scheduled for Friday night, September 15, will begin at 7:30 pm. The SHS Bass Fishing Team Schedule for 2017-2018 is now available on the Central Office and SHS pages. Find them under Athletics in the Documents link. The 2016-2017 Smackover High School Yearbook is for sale now in the high school office for $50. The Smackover 4H will meet the first Tuesday of each month in Mr Jackson's classroom in the SHS Agri building at 3:45 pm. Keep up with SHS' Daily Announcements! These announcements are located on the SHS page under the Documents section. Breakfast and Lunch Menus for September are now available under our Dining and Documents sections on our Campus pages. Last day to purchase tickets for Hooten's football game at SAU Magnolia on August 29 at 5:30 pm will be Thursday August 24. Tickets may be purchased at the SHS office or at central office for $7. Senior picture orders can be placed until September 1st. Orders can be placed online at www.winningstreakphotography.com Football pictures may still be ordered. The first FFA Chapter Meeting of the year will be Tuesday, September 5, 2017, at 6 PM, in the SHS Auditorium. Students are encouraged to attend. Meetings will be every first Tuesday of each month. SES School Pictures have been moved to Wednesday, September 13th. Bring your Best Smile! SHS (Grades 9 - 11) School Day Pictures will be on August 30th! NES and NMS School Picture Day is Thursday, August 31st! Tickets are on sale NOW for the Hooten's Kickoff Classic which will be played on Tuesday, August 29, at SAU at 5:30 pm. Tickets may be purchased at the high school office or central office for $7. National Honor Society dues are $20 for current members. Please pay dues in the SHS office. Bring your Beautiful Smile!!! Smackover High School students in grades 9-11 will have their school pictures taken on Wednesday, August 30th. To view the SHS Rules and Guidelines which will be discussed with high school students on the first day of school, look in the Documents section in the Handbook folder on the SHS page. The 2018 Senior class will be having a Senior Breakfast Monday morning, August 14, 2017, at 7 am in the Smackover First United Methodist Church Fellowship Hall. This is a come and go event. Class lists for the 3 and 4 year old classrooms at Smackover Preschool have been posted! Find them on the SPS page under the SPS Class Lists link. NES and SES Class Lists have been posted! Find them on the campus' webpage under the NES/SES Class Lists heading. You can also view the lists on The Buckaroo Blog. School is almost here! Check out what is being served in the cafeteria during the first few weeks of school! Menus for August are available under each campus' Dining section. Want more information about our District? Check out our SNSD Video on the Central Office page under the Welcome link. Apptegy will be walking the communication team through how to use Thrillshare today at 1pm. The Smackover-Norphlet School District will be closed today for Good Friday. School will reopen on Monday, April 17. 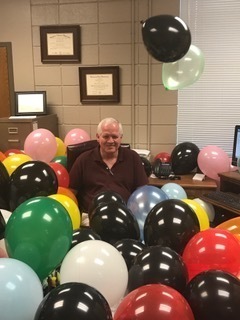 Happy birthday to Norphlet Middle School Principal Keith Coleman who turned 60 years old today! NMS Honor Roll will be announcement later today in the NMS website's news section. The City of Smackover will be testing their storm/tornado siren (will not test in the event of inclement weather) on Wednesday, April 5, 2017, at 12:00 pm noon and will be testing every Wednesday following to ensure proper operation of the system. Please contact Smackover City Hall at (870) 725-3572 from 8 am to 4:30 pm if you have any questions or concerns.